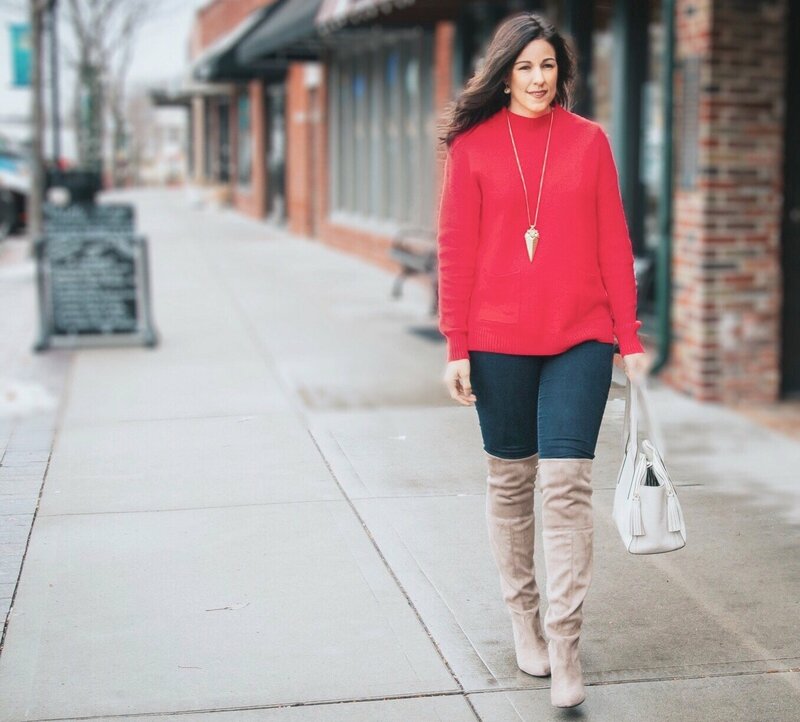 I love to wear bright colors, so when I saw this sweater on sale at Nordstrom for $17…I was SOLD! I’m thinking it’ll be the perfect sweater for Valentine’s Day. James and I have always been pretty casual when it comes to the holiday. We’ve always just made steak and lobster and open up one of our really good bottles of wine. Which brings me to this sweater and skinnies combo. 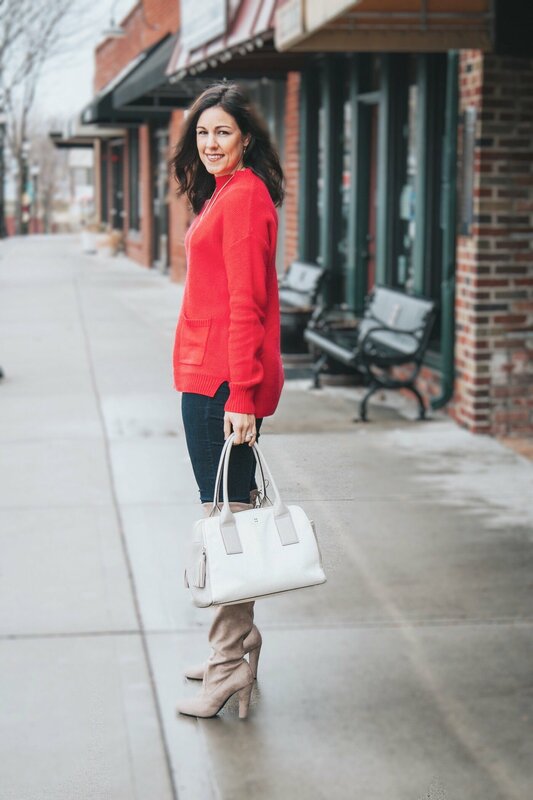 It’s perfect for the casual night in or even if your going out with your girlfriends for a Galentine’s Day celebration! I’ve been thinking though, maybe this year we’ll get a babysitter and go out…just means I’ll have to plan another outfit! I’d love to hear what your Valentine’s Day traditions are, comment below! Thanks for stopping by! Hope you’re having a great week! Pretty look! I love your necklace and boots! 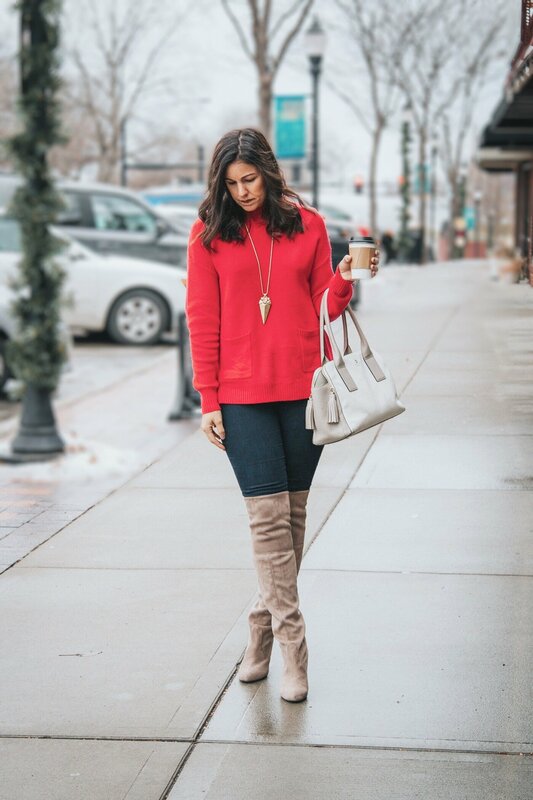 Love the red with the taupe-y boots! I actually have that color combo planned for my Thursday blog post. We usually don’t go crazy over Valentine’s Day either…it’s fun to make dinner together and rent a movie at home. We usually like to pop champagne to make it feel special! This look is so simple yet chic! I love the boots . Very sleek! Such a great look! Loving the sweater and the OTK boots together. Perfect cozy look!